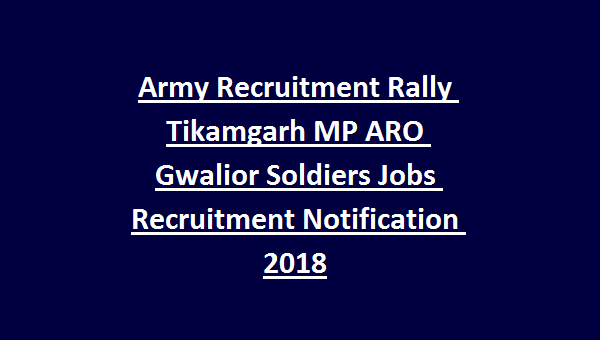 ARO Gwalior Army Recruitment Rally Tikamgarh MP Soldiers Recruitment 2018: Army Recruiting Office, Gwalior released a recruitment notification wherein they invites young & energetic individuals from 9 districts of Madhya Pradesh namely Sagar, Datia, Tikamgarh,Chhatarpur, Damoh, Ashoknagar, Shivpuri, Panna, Bhind, Sheopur, Guna, Morena and Gwalior to contend for the post of Soldiers. Candidates applying for Soldier Jobs under Indian Army must not exceed the upper age of 23 years and below 17 ½ years as reckoned on 01-09-2018. Soldier Technical: Passed 12th class with Science Stream (Physics, Chemistry & Maths), having secured 50% marks as aggregate. Soldier Aviation/Ammunition Examiner: Must have passed 12th class with Physics, Chemistry and Maths as main subjects. Candidates qualifying both the Physical Standards and Physical Fitness Test will be subjected to Detailed Medical Examination including Vision Test, Oral test etc. Written Test will be conducted for Candidates found to be medically fit will be allowed to appear for Recruitment Exam based on syllabus as per the educational standards prescribed for each post. Candidates interested to Serve Indian Army as Soldiers must fill the online application form through the official website http://www.joinindianarmy.nic.in/, registration process of which will last till 31-12-2018. 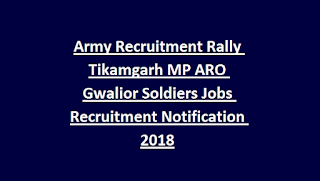 Registered candidates will then have to attend the Army Recruitment Rally at Tikamgarh on the said date as per their call letter. Candidates interested to participate in the Army Recruitment Rally at Tikamgarh, MP Soldiers can refer the official notification.